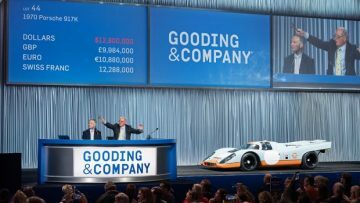 Coach-built Maseratis A6Gs by Frua and Zagato and special Ferraris by Pininfarina are on offer at Gooding Pebble Beach 2018. 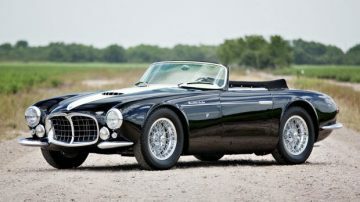 A 1955 Maserati A6GCS/53 Spider by Frua, estimate $5,500,000 – $6,500,000, and a 1956 Maserati A6G/54 Berlinetta, estimate: $4,300,000 – $4,600,000, by Zagato are among the highlights of the Gooding Pebble Beach 2018 classic car auction. 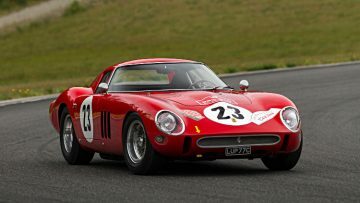 The 1967 Ferrari 330 GTC Speciale, estimate: $3,300,000 – $3,800,000, is one of only four ever built. The 1966 Ferrari Dino Berlinetta GT, estimate: $2,000,000 – $3,000,000, is a one-off prototype built during the development of the Dino 206 and 246 GT. In 1953, Maserati introduced the A6GCS/53, a sophisticated sports racing car powered by a two-liter twin-cam inline six-cylinder engine. Almost all of these Maseratis were built for racing and were extremely successful, claiming class wins at the Mille Miglia and capturing the Italian Sports Car Championship. 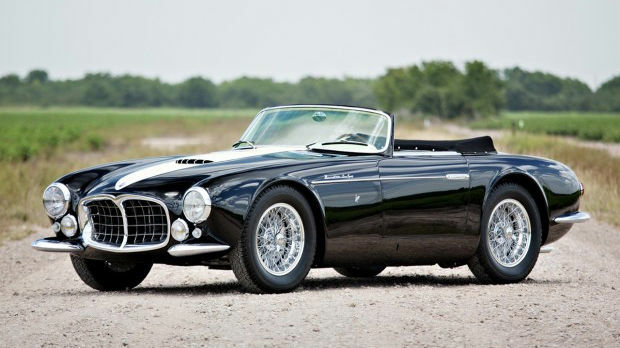 The 1955 Maserati A6GCS/53 Spider, estimate $5,500,000 – $6,500,000, chassis 2110, is an exceptionally rare coachbuilt version of this acclaimed sports racing car, wearing exquisite custom coachwork by Carrozzeria Frua of Torino. The man responsible for commissioning this remarkable car was Guglielmo “Mimmo” Dei, the official Maserati dealer in Rome who later founded the racing team Scuderia Centro Sud. The last of three such examples commissioned by Dei, this A6GCS/53 Spider is widely recognized as Pietro Frua’s greatest contribution to the art of Italian coachbuilding. Perfectly proportioned and possessing intricate details, this elegant Frua Spider was masterfully designed, mirroring the best qualities of the Maserati chassis that lay beneath. Sold new in Italy, the Maserati was exported to the United States in 1959 and was displayed at numerous concours d’elegance in period, including the 1964 Pebble Beach Concours d’Elegance®. 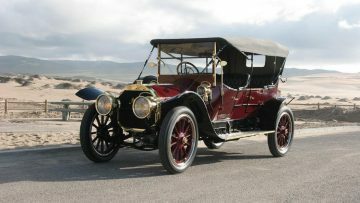 The car would go on to be owned by noted collectors Ken Hutchison, Bill Jacobs, and Bob Rubin. In 2010, the beautifully restored Frua Spider was shown at the exclusive Concorso d’Eleganza Villa d’Este, where it won Best in Class and the prestigious Coppa d’Oro award, which is the Best of Show by public referendum. Finished in a stylish black livery with a cream central stripe, this exceptionally rare Maserati represents an ideal marriage of the thoroughbred A6GCS/53 competition chassis with Pietro Frua’s magnificent coachwork. The result is an undisputed masterpiece of Italian design and one of the most beautiful and desirable sports cars from the 1950s. 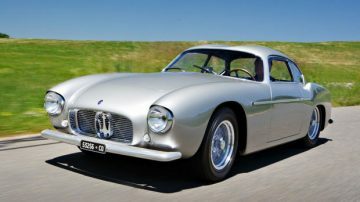 The Maserati A6G/54 is the essential Italian GT of the mid-1950s. A mere 60 of these chassis were produced and, of these, master coachbuilder Carrozzeria Zagato of Milan built 20 examples with lightweight alloy berlinetta bodies. The Zagato-bodied examples are decidedly the most beautiful, sleek and performance-oriented of the line. This 1956 Maserati A6G/54 Berlinetta, estimate: $4,300,000 – $4,600,000, chassis 2155, is the 17th A6G/54 Zagato-bodied Berlinetta built and featured a distinctive double-bubble roof from new. After being raced at the 1956 Mille Miglia, 1957 Trieste-Opicina Hillclimb and other period races, 2155 was re-bodied by Zagato in 1958 as a unique design study for the new 3500 GT model. About 10 years ago, the Maserati was restored by Italian marque specialists with further work carried out by the esteemed Paul Russell & Company and has been presented at numerous events, including the 2009 Pebble Beach Concours d’Elegance®, 2010 The Quail; A Motorsports Gathering, and the 2014 Pebble Beach Concours d’Elegance® for Maserati’s centennial celebration. This beautiful Maserati is particularly collectible for its unique Zagato design and rich racing history, especially with its remarkable one-off coachwork finished in silver with blue upholstery. This rare A6G/54 would make an outstanding addition to the finest collections. Unveiled at the Brussels Motor Show in 1967, the 330 GTC Speciale was hailed as a brilliant Ferrari-Pininfarina collaboration. The modern design captured the very essence of late 1960s motoring, combining features from Pininfarina’s latest show and concept cars. One of only four such examples ever built, and featuring razor-edge lines, curved glass and trailing pillars creating a dramatic and beautiful effect, this 1967 Ferrari 330 GTC Speciale, estimate: $3,300,000 – $3,800,000, chassis 09653 is among the last of the great coachbuilt Ferraris. 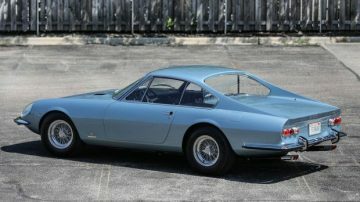 Finished in Aurora Blue with black upholstery, this Ferrari was displayed on the Pininfarina stand at the 1967 Geneva Motor Show, and then delivered new to famed American heart surgeon Dr. Michael DeBakey. 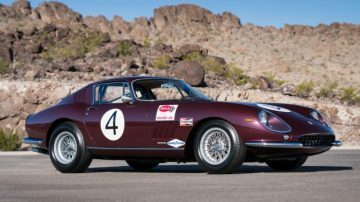 Eventual owners included noted Ferrari collectors Norm Silver and John Mecom Jr., both of whom focused on limited-production coachbuilt Ferraris. Restored in 1991, the 330 GTC Speciale garnered several important honors, including First in Class and the Luigi Chinetti Award at the 1992 FCA National Meet, as well as a First in Class at the Vintage Ferrari Concours at Concorso Italiano in August 1992. Not only is 09653 a beautiful custom-bodied Ferrari with an impressive and fascinating provenance, it has been out of the public eye since it was last shown in 1992. In May 1965, Pininfarina designer Aldo Brovarone produced a sketch that would serve as the basis for the Ferrari Dino, which was named after Alfredino “Dino” Ferrari, Enzo Ferrari’s first son. The concept was a short-wheelbase, two-seat coupe with aerodynamic lines and beautiful, rounded front fenders. Pininfarina’s first prototype, known as the Dino Berlinetta Speciale, was unveiled at the Paris Auto Salon in October 1965. Afterward, Pininfarina continued to develop a Dino concept that was more likely to be used in production. 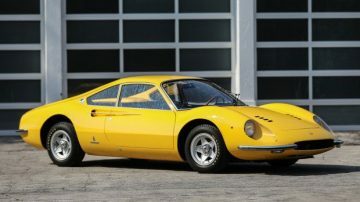 Their efforts resulted in the car presented here, the Berlinetta GT, the second prototype for the Ferrari Dino. Constructed in 1966, the Dino Berlinetta GT was the first mid-engine, six-cylinder Ferrari designed from the outset for use as a road car. This Dino Berlinetta GT was presented on the Ferrari stand at the Torino Motor Show in November 1966 and marked a major turning point in the company’s history. Finished in Fly Yellow with its interior trimmed in black leather and blue cloth, this one-off Pininfarina show car featured a two-liter Dino engine, placed longitudinally rather than transversely, as seen in the production model. It was this car that inspired the final design of the subsequent 206 and 246 GTs, among the most revered production models in Ferrari history. For the past 25 years, this groundbreaking Ferrari has been a crown jewel in one of the most impressive private collections of postwar Italian sports cars ever assembled. During this period, the Berlinetta GT has been featured in countless books and articles on Ferrari, Pininfarina, and the Dino model, and yet remains just as mesmerizing today as it did upon its debut at the Torino Motor Show. A one-of-a-kind Dino prototype, designed and built by Carrozzeria Pininfarina, one of the most successful and influential Italian coachbuilders, 00106 is a world-class automobile that possesses every special quality sought after by discerning collectors.